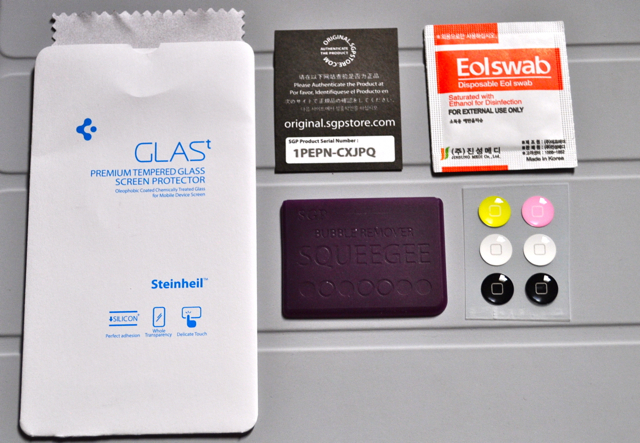 I’ve always been a fan of SGP’s Steinheil Ultra Series screen protectors. These crystal clear, finger-print resistant films allow easy, bubble free application that makes them one of the best offerings in the market. However, makers of these industry leading protection films have just come up with an even better solution called the SGP GLAS.t, which unlike any other screen protector, is made from premium tempered glass. Yes, that’s right. It’s a glass that protects the glass underneath! Find out more in our full review after the break. Whole Transparency: The GLAS.t is 0.4mm think and made with chemically treated transparent tempered glass. 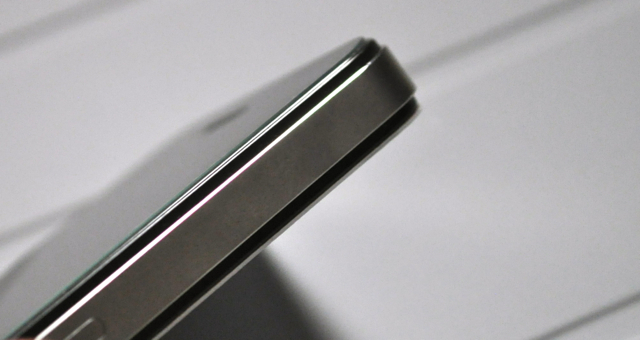 Surface Hardness: 8-9 H: The surface of the GLAS.t has a hardness of 8-9H, three times stronger than regular PET film. Even sharp objects such as knives and keys will not scratch the GLAS.t. 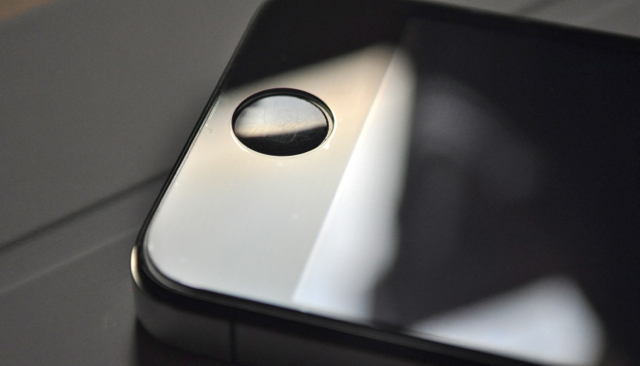 Oleophobic Coating: The GLAS.t has an oleophobic coating that prevents fingerprints and other contaminants and makes the film easy to clean. Delicate Touch:The GLAS.t is coated with a strong silicone adhesive that makes installation easy and attaches the film firmly which does not affect the touch screen’s sensitivity. Spigen SGP GLAS.t for iPhone 4/4S ships in an attractive looking box. Opening it up reveals a bunch of goodies in addition to the glass protector film. You’ll get a GLAS.t screen protector for iPhone 4/4S, a set of 6 epoxy coated home buttons, a squeegee for bubble removal, a microfiber cloth, an alcohol swab and an authenticity card with a unique serial number. The included set of epoxy coated buttons is actually a pretty cool inclusion. There are two black buttons, two white buttons and one button each in yellow and pink. They look and feel really nice. 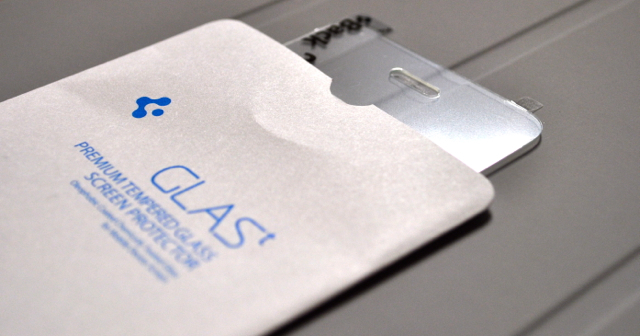 In fact, I’ve put one on all my iPhones and iPads, even those without a GLAS.t protector. 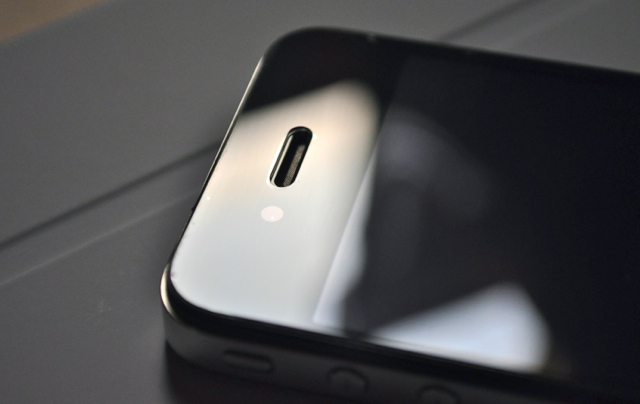 The reason why SGP decided to include these buttons is that once you apply the 0.4mm thick GLAS.t screen protector on your iPhone, you’ll notice a slightly raised edge around the home button. So, to make up for this slightly increased depth, the’ve included a set of convex surfaced stick-on buttons. Installing the GLAS.t requires a little extra bit of care as compared to conventional screen protectors. 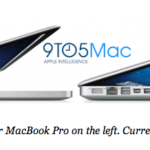 Due to its slightly thicker and harder material, you only get one shot at installing it. So, before you take the plunge, remember to wipe the iPhone’s screen with the included alcohol swab, which actually does a pretty good job at removing dust particles, and then clean it dry with the microfiber. For best results, ensure a dust free environment, preferably a room with closed windows. I recommend switching off any fans during application. 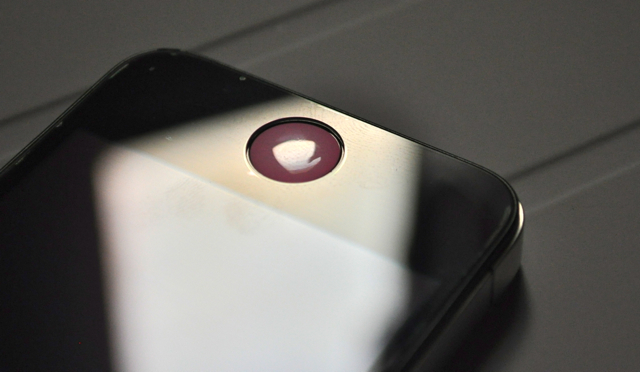 When you’re ready, just peel off the cover film, align the GLAS.t protector with the speaker and home button cutouts and place it on the iPhone. Once you’re satisfied with the film’s placements and alignment, tap it gently at the middle and the protector’s adhesive will smoothly begin spreading over the screen. Air bubbles, if any, can be removed easily by using the included squeegee. Any bubbles due to dust particles will most likely be permanent. Luckily for me, I got it just perfect! I personally don’t think that the home button feels much deeper with the GLAS.t than without it so using the epoxy home buttons purely comes down to your personal preference. 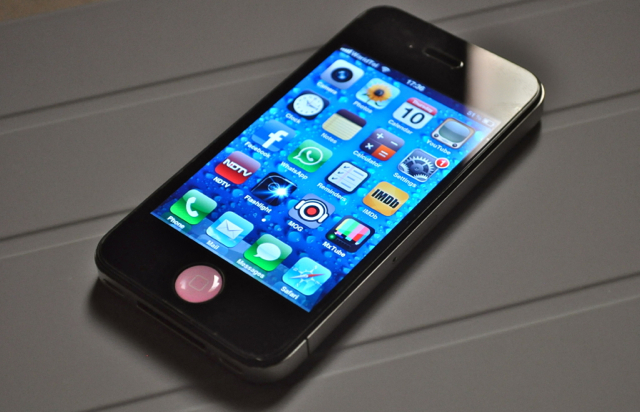 I like how the buttons look so I chose to use them (this is actually my wife’s iPhone, hence the pink color :P). 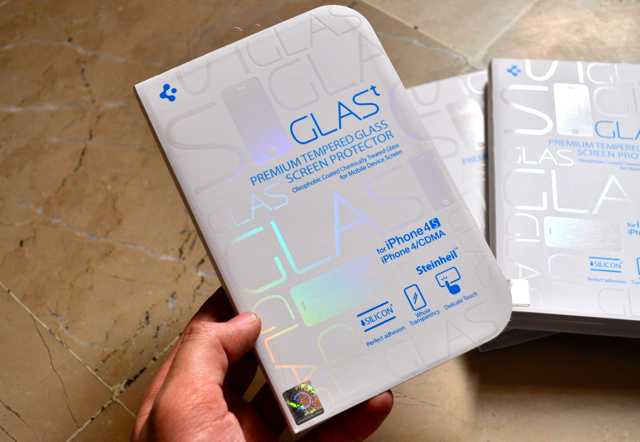 Now the question is, is GLAS.t any better than the conventional screen protectors? The answer is, hell yes! This is one of those times when you say “you gotta see it to believe it!”. 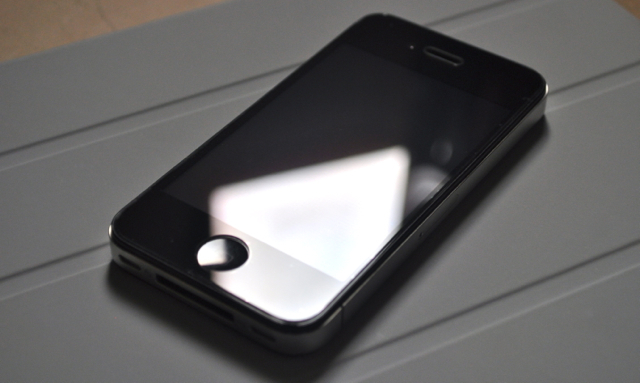 It looks as if there is no screen protector at all. 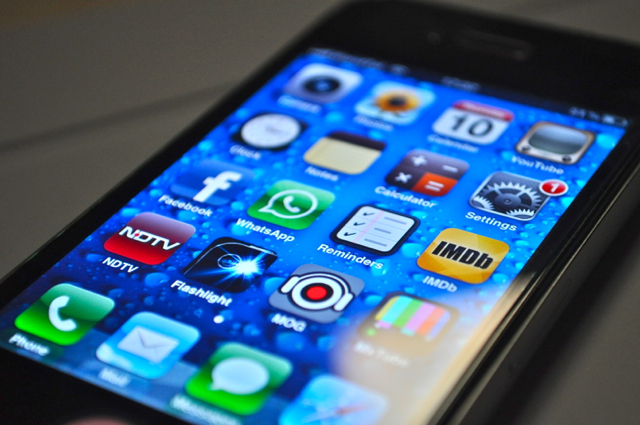 The glass is silky smooth to touch, just like the iPhone’s own glass and if you’ve just upgraded from a plastic screen protector, you’ll feel as if your iPhone’s Retina has just come back to life. While I didn’t perform any drop tests, I did try scratching the GLAS.t with a pen and some keys but I was amazed to see, it didn’t allow me to succeed. So, the GLAS.t not only looks brilliant, but also provides better scratch and scuff protection than any other screen protector I’ve ever come across. 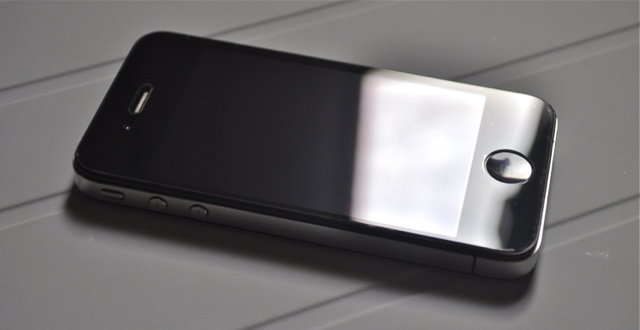 I’ll safely conclude by saying that that Spigen SGP GLAS.t is simply the best screen protector for iPhone 4/4S out there that maintains the gorgeous Retina clarity and feel good glassyness you get while using your iPhone without a screen protector.